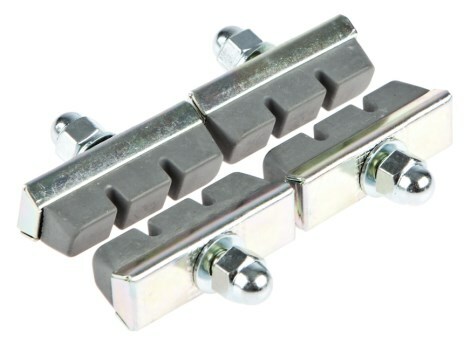 Kool Stop rod brake pads for your Raleigh DL-1, vintage Phillips, etc. Has anyone tried the BLACK versions of these and found them to be effective? From what I understand, the special compound is found in the orange pads. But orange brake pads on my vintage Phillips just doesn't look "right." Anyone try these? Curious if they are as good or better than the Koolstop. I used black compound Kool Stop pads on my Campagnolo equipped Raleigh Professional at last year's Eroica and they were great. It was raining a good portion of the time, muddy in places and there were no problems whatsoever. I've tried the orange Kool Stops; they're marginally better than standard-sized Fibrax, but not as good as the oversized Fibrax (SH 144, a.k.a. ASH 144). Harris is sold out, but if you google around a bit you can probably find some ASH 144s for a decent price.